to putt on than fast greens. Slow greens can often see you putting short. However, there are solutions to deal with the situation. Hoping for fast greens isn't one of them. Slow Greens are not to everyone's liking. Yet fast greens can often result in more three putts a round. This is because the ball breaks more on the faster surface making it more difficult to calculate the balance between line and length. Every time you putt you are being challenged to interpret the speed of the green and how it will affect the way your ball will travel to the hole. Green speeds change according to the season and the program to maintain the greens in a healthy condition. If you play the same course regularly you will know this, but it doesn't make judging the correct roll any easier. In psychology, the Stroop Reaction Test requires you to name the colours from a block of words. For example, if the word BLUE is printed in red, you should say RED. When the name of a colour appears in a different ink than the colour named, naming the colour of the word (rather than the word itself) takes longer, and is more prone to errors. 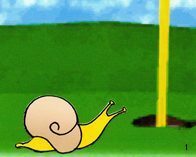 When it comes to putting on greens that are slower than what you are used to, the information your brain receives causes a problem in much the same way as it does in the Stroop Test. Your brain has been habituated to associate a certain distance with a certain amount of force. Now you need more force to get the ball to the hole. I have played many a round after the greens have been cored and sanded where everyone in the group continually comes up short of the hole. 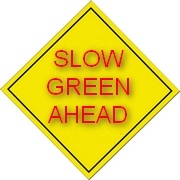 We all know that the greens are slower than normal, but we can't seem to adjust. It is as if our brains are blocking a longer backstroke. Before each round of golf you should calibrate your backstroke to the speed of the greens for that day. 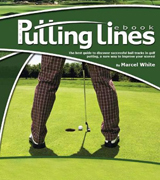 These reference or core putts help you to anticipate what you can expect out on the course. All 18 greens are supposed to be mowed so they all run at the same speed, and hopefully this will be the case. It is not just the amateur or weekend golfers that struggle to the changing pace of greens. In the 2001 US Open at Southern Hills the officials had to change the mowing pattern on the 18th green to keep it fair, leading to a slower speed than the other greens. This caused the players endless frustration and distance control problems despite being aware of the difference. So how do you deal with greens that are slower than what you typically putt on? You estimate a distance from your ball to the hole, and your brain without you thinking gives you a backstroke that, under normal circumstances, should work. But you know that there could be a problem, so you force your stroke. Wrong. 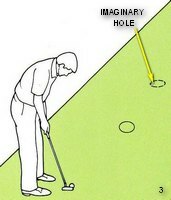 I believe the solution for slow greens is to make a mental adjustment and putt to an imaginary hole that is beyond the actual hole. Then you take your everyday stroke and putt for this hole. There is no attempt to hit the ball any harder than you would do if you had a putt of this length on the green speed that for you is the norm. Slow Greens add to the challenge of putting. You can't avoid them if you want to play regularly, so knuckle down and putt.